We will do everything we can to meet your expectations of advanced vehicle diagnostics on air bags, lights, engine lights, service lights, ABS systems, plus any associated problems. We cover most makes and types of vehicles including light commercial, and we use the latest techniques and diagnostics equipment to make it a simple process to make adjustments to your engine. Reliability is never affected. If for any reason you require your original files to be re-loaded at a later date, ask us to make a backup that you can load onto a USB stick and you can use this file any time you wish. We supply solutions not excuses! It’s never a good time to see warning lights on your dashboard. 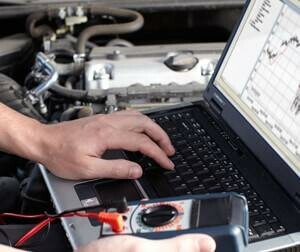 We are here to take the worry out of vehicle electronics. Call us and an engineer will meet you in our mobile workshop loaded with specialist diagnostic computers and tools – problem solved!